Does this look familiar? The 2013-14 winter season was one of the coldest winters in 20 years. Nearly 50″ of snow fell in the Midwest and Northeast… Then the snow melted leaving wrecked and ripped auto pool covers. Tracks were pulled out of the concrete or coping, covers were torn or ripped, and many had fallen into the pool. Auto pool covers are not winter covers. However, we have a solution that will save you money and relieve some winter blues: a Safety Cover designed to handle the elements. An Automatic Pool Cover is defined as a barrier over your pool that no child or pet can penetrate. 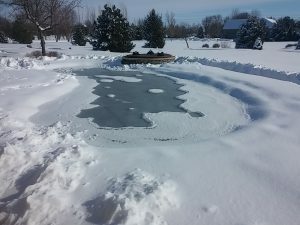 Auto Cover Manufacturers have a long list of related risks regarding the use of motorized automatic pool covers as winter covers including; Maintaining the proper water level, leaving a cover pump on the cover to pump off excess water from snow and ice melt, warranty does not cover damage from winter use, and a cover should only be used as a winter cover if it has the proper slack. 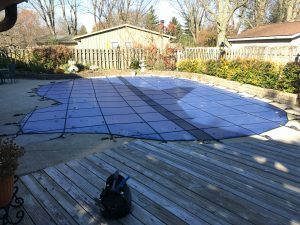 Mesh or solid safety covers are designed specifically as winter swimming pool covers. 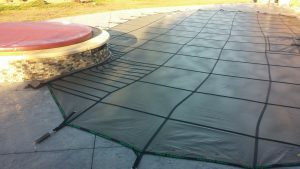 Safety covers do not collect water and do not require the pool to be at a specific level to maintain the slack in the cover. Safety covers are spring loaded allowing the cover to flex when weighed down by snow or ice. 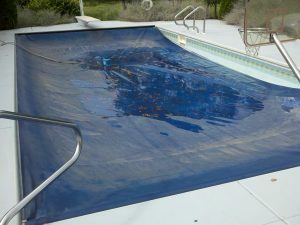 We recommend retracting your automatic pool cover for the winter and installing a safety cover. A mesh or solid safety cover is designed and engineered to stand up to the harshest weather conditions. A Safety Cover will reduce the amount of water and chemicals you lose over the winter and the amount of cleaning necessary to open your pool in the spring. A Safety Cover will protect your auto cover from damage during the winter months. Do you agree or disagree? Comment Below..
Wow really impressive and informative article. You have clearly outlined the points and I enjoyed to read. Definitely, Automatic Pool Covers work good to keep children and even adults out of the pool if you do not wish to have them in the pool.